With plantar fasciitis, the bottom of your foot may hurt when you stand, especially first thing in the morning. Pain usually occurs on the inside of the foot, near the spot where your heel and arch meet. Pain may lessen after a few steps, but it comes back after rest or with prolonged movement. First, your doctor relieves pain. Then, the cause of your problem may be found and corrected. If your pain is due to poor foot mechanics, custom-made shoe inserts (orthoses) may help. · To relieve mild symptoms, try aspirin, ibuprofen, or other medications as directed. Rubbing ice on the affected area may also help. · To reduce severe pain and swelling, your doctor may prescribe pills or injections. Physical therapy, such as ultra sound or stretching exercises, may also be recommended. · To reduce symptoms caused by poor foot mechanics, your foot may be taped. This supports the arch and temporarily controls movement. Night splints may also help by stretching the fascia. If taping helps, your doctor may prescribe orthoses. Built from plaster casts of your feet, these inserts control the way your foot moves. As a result, your symptoms should go away. Your doctor may consider surgery if other types of treatment don’t control your pain. During surgery, the plantar fascia is partially cut to release tension. 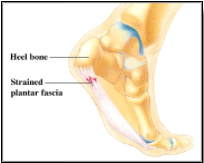 As you heal, fibrous tissue fills the space between the heel bone and the plantar fascia. · Lose any excess weight. · Avoid running on hard or uneven ground. · Use orthoses at all times in your shoes and house slippers.